Quite faint, relatively large, round, evenly bright. Barely seen with direct vision. Less evident. Quite large, roundish, nearly evenly bright. Observed from city with a cheap spotting scope from a discounter! Difficult to hold. Relatively large, round, almost evenly bright glow. Large, very diffuse, slight brightening toward the middle, nearly round. On the DSS image the connection of both galaxies is apparent. NGC5218 is a spiral (SBb), whereby NGC5216 is an elliptical galaxy of the type E0. The southern lump of NGC3656 is MCG+9-19-64 (b15.0m, 0.4x0.2'). Both form Arp155. Barely seen with direct vision. Roundish to slightly oval, nearly evenly bright. The southern extension (=MCG+9-19-64) wasn't visible. The much more fainter companion UGC6016 is located southwest of NGC3448 and faintly visible on the DSS image. NGC3788 was already visible at 48x and appeared elongated and evenly bright. At 85x NGC3786 was seen as faint, oval, evenly illuminated brightening. The eastern, very elongated & thin galaxy PGC35631 is not part of Arp322, but forms Hickson 56 together with the other galaxies. Very thin, elongated, evenly bright, faint. Elongated, thin, evenly bright. At the limit of perception. Very elongated, thin, evenly bright. Not particularly evident. Only well visible with averted vision. At 12x easily visible as elongated nebula. At 112x the dark lanes were pretty evident with averted vision. At 25x elongated, fairly thin, nearly evenly bright. Barely visible with direct vision. At 62x I could glimpse at least 2 dark lanes. 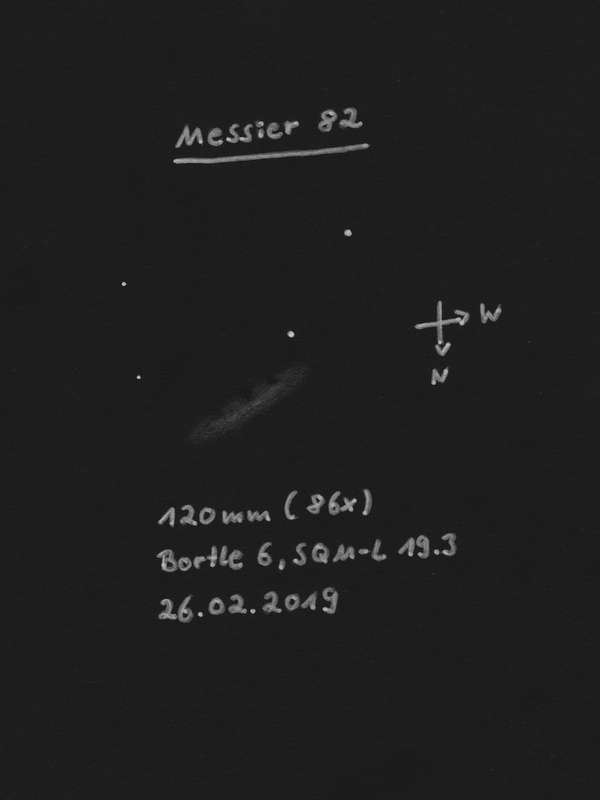 Observation from outskirts at almost full moon with a angular distance of 60° from M82! At 28x barely seen with direct vision, very elongated, fairly thin, nearly evenly bright. Cigar-shaped. At 72x 2-3 dark lanes visible with averted vision, most obvious on the eastern edge. Observation at full moon: At 18x thin, elongated, evenly bright. At 75x 2 dark lanes apparent with averted vision.